The 22nd article by John Royer, our PSP correspondent who tragically passed this past September, is full of his usual humor as he faces the Monster, PSP. I have been talking to my nephew for the last few days over the Internet. He is 58 years of age. And I am 71 years of age. The difference makes us more like brothers than uncle and nephew. He has Cerebral Palsy, CP, which in many respects is like PSP. His name is Jim Royer and he is my middle brother’s eldest son. If I have my information correct, Jim’s problem started when he was being formed and was caused by an illness that his mother, my sister in law, had at the time. It is not clear at all what the mechanism is that cost this unfortunate event to happen. My problem started at age 68 and the rest you already know. Thunder has just started. I hope it doesn’t cut the power. Anyway, to continue. Jim has the difficulty of standing forward on his toes because the cords in the back of his leg are tightened permanently and his brain is damaged. My problem is trying to keep my balance. The result is that we both have a tendency to fall. In that respect we are quite similar. But Jim’s eyesight is not affected. Ron Vickroy, my friend, and I have our eyesight affected adversely so in that respect Jim is in a lot better shape than I and Ron are. Ron and I have the monster PSP in common. But all three of us have the misery of gait abnormality in common as well. All of us have difficulties within our brain that causes our muscles to malfunction. So where did this palsy come from, this thing that has affected our brains adversely. No one can give us an answer and there are many others who are affected equally with similar gait disorders. I guess we are the trio of trippers. It’s a strange club to belong to. The advantage Jim has is the fact that his disease is not a terminal one like PSP. Sometimes I feel like I could just scream. But that would just get me arrested by the police for disorderly conduct. But at least in a jail cell I would have something to hold onto, the bars. My nephew has suffered his problem all of his life and Ron and I did not, but we are going to get a lot of misery compressed into 10 to 12 years at the most. At the end of September, my wife and I are going to see about getting an electric wheelchair for me as I steadily digress into a worse condition. The idea doesn’t make me full of joy because it’s one step further down the declining slope of PSP. Speaking for myself, I have to say that I couldn’t accomplish anything without my wife Mary. She is always by my side ready to hold my hand to prevent me from falling when I’m stupid enough to try and walk on my own. At this point I have to use the transport wheelchair. We paid for both transport and outside wheelchair. The problem with the outside wheelchair is that it is a misery to try and get into the back of a small car by her and it is very difficult for Mary to push it on any kind of incline. Further, I have tried using it myself on a paved path. They have slopes to get the water to roll off when it rains to the left or right. The problem with that is that if the incline is to the left I go left and if the incline is to the right I go right. Not a safe situation to be in. In there are the bumps! It looks like an electric wheelchair is the way to go or I am basically housebound except for my elderly wife, and son and daughter (who have jobs). I wonder if I can use one to do a wheelie? I hope I do not have any problems with Medicare when the time comes to get an electric wheelchair, which is now. 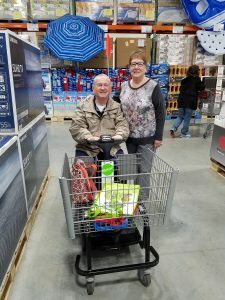 It is over a half of the year since Medicare has fought with me regarding the $500 mechanism to lift a $1,500 handicap wheelchair up so that I can stand without Mary ripping an elbow off to help me stand up and get me on a chair. We paid for a $1,200 aluminum ramp to the front door and an $800 concrete ramp to the street at enormous cost and Medicare does not pay for that at all. How does Medicare expect you to get to a doctor’s appointment? Crawl? What do very poor people do? I live in the United States by the way. When I see the people in electric wheelchairs I wonder at their happy demeanor and their laughing smiles. I’m going to have to think up some wheelchair jokes very soon. Perhaps electric wheelchair races, too? Funny is still good even with problems.